Hamill (Aghacommon, Lurgan) December 5, 2018 peacefully at home. Anthony (Tony) beloved husband of Mary and loving father of Gregory, Andrew and the late baby Celine, a much loved grandfather of Jake, Kirsty, Mollie-Mae and Sophie. Funeral from his home, 22 Kilvergan Road, BT66 6LF on Saturday at 11.30am to St Patrick's Church, Derrymacash for 12.00noon Requiem Mass. Burial afterwards in the adjoining cemetery. St Martin pray for him. Sadly missed by his sorrowing wife, sons, grandchildren, daughters-in-law, brothers, sisters, brothers-in-law, sisters-in-law and entire family circle. 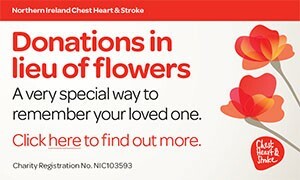 Family flowers only please with donations in lieu if desired to, Spina Bifida Hydrocephalus Ireland, c/o McAlinden & Murtagh Funeral Directors, 5 William Street, Lurgan. Tel: 02838 324404. I am sorry to tell you that Anthony (Tony) Hamill has passed away.